The median U.S. household now earns about $61,372 a year, up nearly 2 percent from 2016. 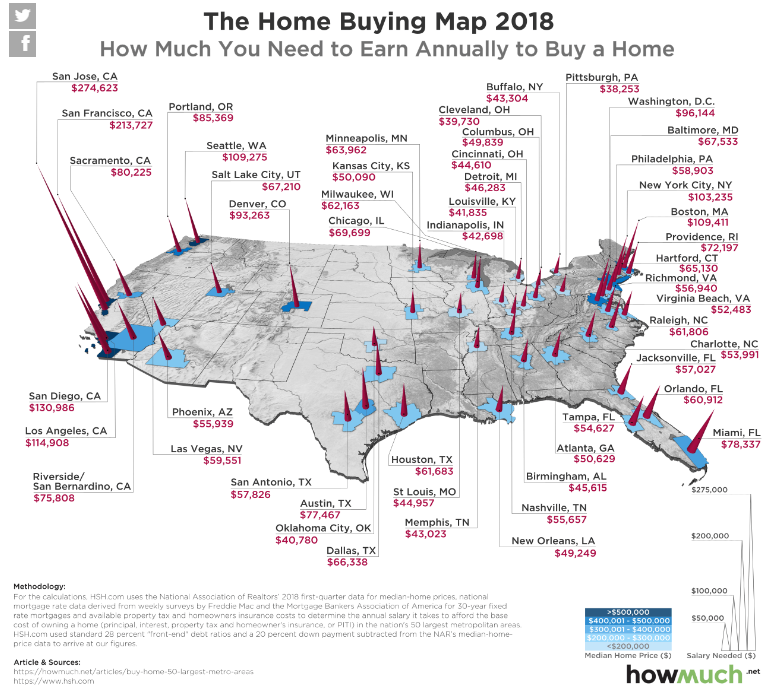 Still, in order to afford to buy a home in one of the country's hottest and most expensive cities, like San Jose, California, you'd need to make more than four times that amount. That's according to financial website How Much, which crunched numbers from the National Association of Realtors and mortgage-information website HSH.com to determine where it's most expensive to buy an "average-sized home." Researchers found the median price of homes in the 50 most populated metro areas across the country and "calculated monthly principal, interest, property tax and insurance payments buyers have to pay for a 30-year fixed rate mortgage," says How Much. "Median household income across the United States recently reached a record high, which is great news for workers," says How Much. "The bad news is that isn't enough to afford a typical home in 25 out of the 50 cities on our map." That's especially true on the West Coast. "Our map reveals three tiers in annual income workers need to earn to afford a median home. First, the West Coast stands out as by far the most expensive market in the country," the report says, "with four out of the top four markets in California alone." "The second tier of expensive locales is along the East Coast," How Much reports, "led by the familiar hot spots of unaffordable housing like Boston, New York and Washington, D.C."
In Portland and Denver, meanwhile, homes aren't as expensive as they are in California or New York, but workers would still need to make about $85,000 a year to afford to buy. No matter where you fall on the map, though, living within your means and employing common-sense budgeting tactics can help you save in the long run. If you're looking to buy a home, be sure you're ready to transition from renting and if you're going to continue to rent, check out these savings hacks and other ways to make your money stretch further.